As usual, there is no shortage of quarterback-needy teams in the NFL. Jacksonville and Miami very likely look for immediate change while Denver and the New York Giants need fixes very soon. Alex Smith’s gruesome leg injury unfortunately creates uncertainty in Washington. Tampa Bay and Tennessee probably stick with what they have in 2019 but the future appears murky, at best, for Winston and Mariota. Oakland and Cincinnati are lower probability bets for quarterback moves where Carr and Dalton continue as mediocre options. New England, Pittsburgh, and the Chargers may soon address their respective long-term situations. We should be clear right from the start. This is not a good year for teams with quarterback needs. 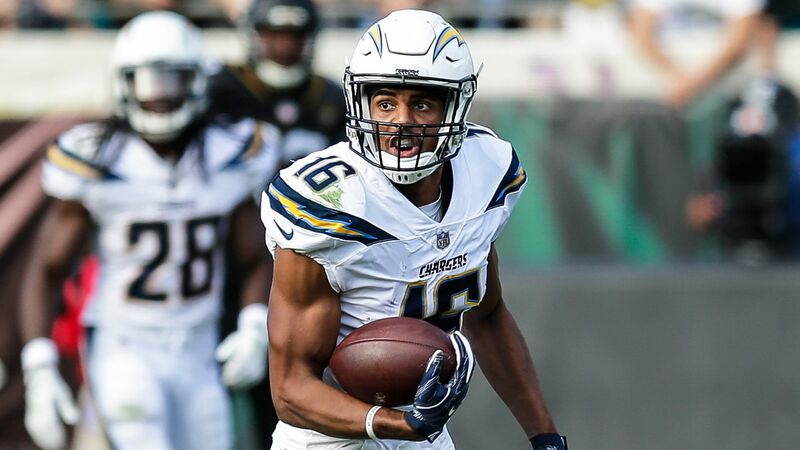 The draft class does not rate anywhere near 2018’s lot and the free agent group does not have a single plug-and-play starter. Teams might decide to stick with what they have in many cases as they do not view available quarterbacks as significant upgrades. The reader could see many teams just “taking their lumps” next season in preparation for 2020. The fact that this article begins with Bridgewater says all you need to know about the 2019 free agent quarterback class. Bridgewater does not possess much upside but has long-term competent NFL starter potential. That is enough to put him ahead of most of the other quarterbacks on this list for many NFL teams. We have seen nothing from Bridgewater which suggests he will be much of a fantasy option for any of the potential suitors. New Orleans might convince Bridgewater to sign a longer-term deal to remain with the Saints as their long-term option at quarterback. Taylor shot out of nowhere in 2015 for Buffalo finishing as the 7th highest rated passer after years on the bench in Baltimore. Unfortunately, Taylor has seen a steady downward trajectory to his career ever since seeing his yards per attempt, QBR, and passer rating fall each and every year from his first starting season. The run culminated with a disastrous 2018 in which he was benched for Baker Mayfield after four games. Still, there is potentially a spot for Taylor as a starting quarterback. We can forgive any player’s stint with Hue Jackson in Cleveland. Taylor plays a very conservative style which minimizes turnovers and makes enough plays with his legs to extend drives occasionally. Jacksonville, for example, seems a particularly attractive spot for him where the defense will be counted on to win games. 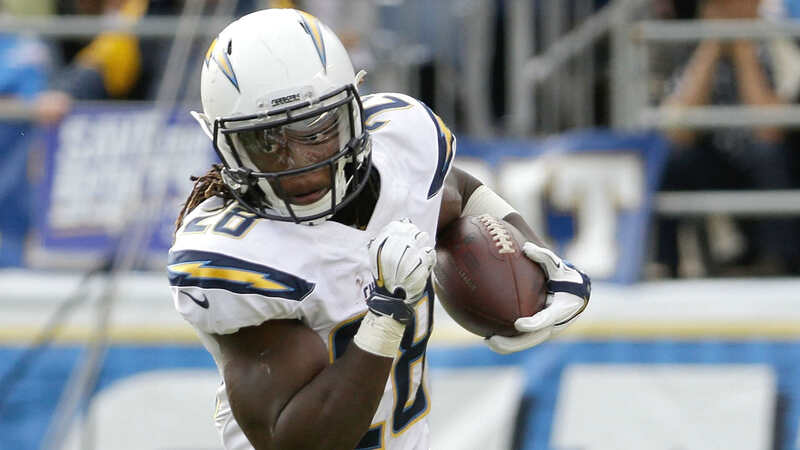 Taylor’s rushing ability can mean big fantasy points so he needs to be on the radar, especially in deeper leagues if a team signs him as a starter or injuries occur. The downside of Bradford is readily apparent. He can not stay healthy. Bradford appears molded from the most brittle substance on the planet. The odds do not appear good that he will get a starting job in 2019. Still, coaches around the league seem to like him as he continually gets starting chances with multiple teams. His career trajectory pointed upward until his 2017 injury. 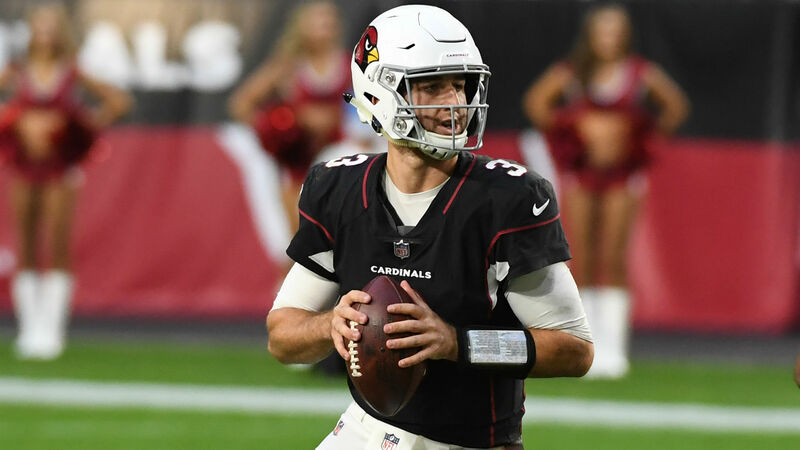 Like Taylor, we need not diminish Bradford too much for an ugly 2018 in which no offensive skill player on Arizona had much of a chance given the coaching staff and offensive line deficiencies. The Philadelphia legend probably earns top pick among NFL teams if he becomes a free agent. Foles’ career may be best described as inconsistent. He had one of the all-time amazing years in 2013 with an incredible 27-2 touchdown to interception ratio and led Philadelphia to the Super Bowl title in 2018 during a great post-season run. He ranged from a solid starter to a bottom-end option during the various games for three teams over the rest of his time in the league. His contract presents lots of options. The Eagles could pick up the $20 million salary option for 2019 forcing Foles to give back $2 million to buy his way into free agency or setting up a potential trade. This move proves potentially problematic tying that much money to a backup quarterback. 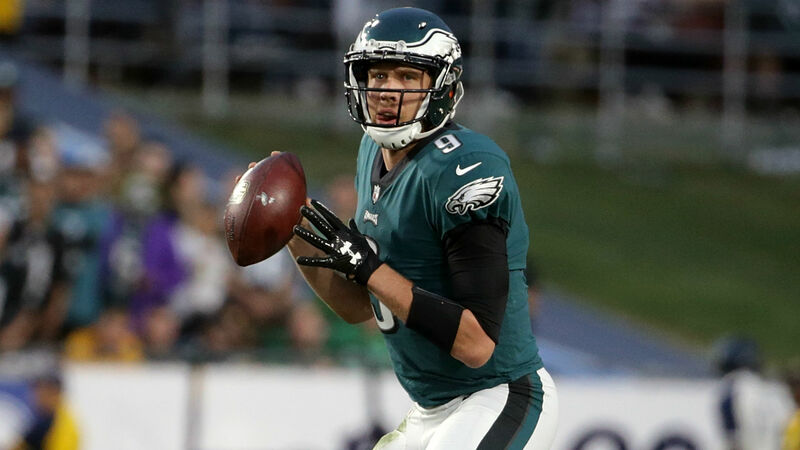 The more likely option allows Foles to hit free agency capitalizing on his recent post-season success to a starting job in 2019. Flacco parlayed the Ravens’ 2012 Super Bowl title into an enormous contract which has been a disaster for Baltimore. The contract had to be reworked for cap purposes extending the contract further out leading to continual cap problems for Baltimore. In return, the Ravens received mostly bottom-level quarterbacking keeping Baltimore in that ugly middle-tier of teams despite having a strong defense most years. His contract is reasonable with no guarantees left and a $18.5 million salary for 2019. The question is what type of team would be interested in Flacco? He won’t be the long-term answer for any team, would just delay the inevitable for teams not really in the super bowl hunt, and is not a significant upgrade on the host of marginal starters floating around he might replace. Flacco possesses very little fantasy relevance wherever he ends up. A new group of potential quarterbacks emerge if teams decide to move on from their current starters. The Dolphins fired Adam Gase which could mean the end of Ryan Tannehill in Miami. He displayed some quality throws occasionally with good athleticism but comes with immense injury baggage and struggles with pocket awareness. The most likely scenario for Eli Manning is retirement or the Giants convincing themselves once again they are not as far away from contention as they actually are with Manning returning again for 2019. Blake Bortles is almost certainty done in Jacksonville following multiple benching. He also almost certainly will not be starting for any other team in 2019. One great season convinced Denver to give Case Keenum a solid contract and ignore the rest of his career. His masquerade as a starter in the NFL may end sooner than later. Numerous interesting stories exist at the midway point in the NFL season from Patrick Mahomes emergence to the uptick in offensive production across the league. This article looks at a few quarterback situations in flux and what that means rest of season for your fantasy team. The writing concentrates on the Bortles scenario and how Jacksonville arrived in the place they are, with lessons learned from how they handled his contract. 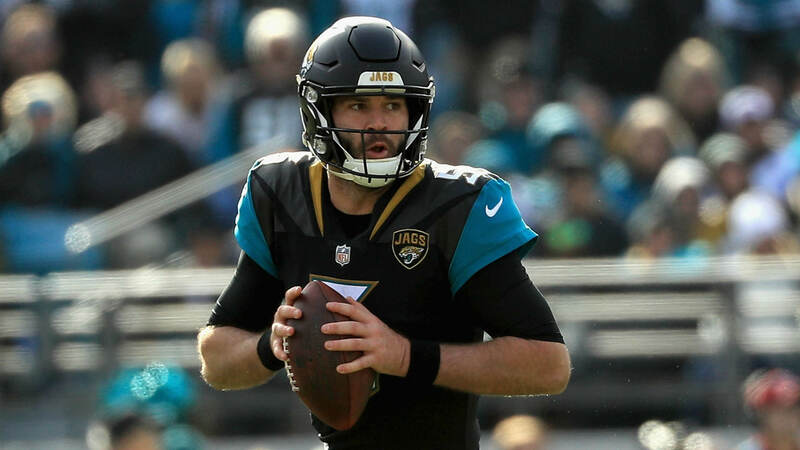 Jacksonville benched Blake Bortles week 7 in a move which clearly foreshadows the end of his time as starting quarterback for the Jaguars sometime in the near future. The question remains how did the Jaguars get to this point with Bortles still as their starting quarterback and significant money left on his contract? A calamity of faulty reasoning and different biases supply a big piece of the answer and give examples for NFL teams and RSO GMs of what not to do to get in this type of trouble. Jacksonville picks up Bortles’ 5th year option. This act set in motion future events for the Jaguars with relation to Bortles. General manger Dave Caldwell picked up Bortles’ option under two primary reasons. First, Caldwell contends the $19 million option was a relative bargain at quarterback. The obvious question that comes to mind is what possible reason would the Jaguars have in franchising Bortles? No other NFL team was going to give Bortles anything remotely close to $19 million per season, much less the expense of a franchised quarterback. The odds that another team would have even given him a starting opportunity were extremely low at the time. It is clear Caldwell misevaluated Bortles value, both on the open market and to his own team. The fact that Bortles was Caldwell’s first pick for Jacksonville likely influenced his decision to pick up the option. The second reason given by Caldwell for picking up Bortles’ option is his relatively cheap two-year salary with the extension. This classical error may be seen across the business world. The final year of Bortles’ rookie contract was already locked in and should have had no bearing on the new decision to pick up his option. What the deal averages out to when including old contract numbers is irrelevant. Lesson for RSO GMs: Take your ego out of decisions when franchising or extending players. Do not let the fact that you drafted a player influence your decision on future contracts and his worth. 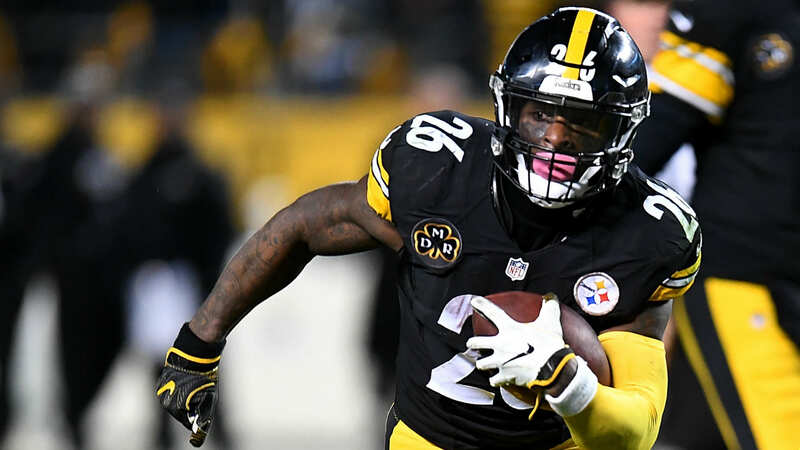 Examine the player’s expected value in your league to determine an appropriate salary and be prepared to move on if the franchise tag or extension price is too high. Jacksonville signs Bortles to three-year extension. Caldwell doubled down on the option mistake by signing him to a three-year $54 million extension following the season. The extension, in part, stems from the option by reducing the $19 million cap hit to a more reasonable $10 million in 2018. This came at the cost of $16.5 million in dead cap for 2019 which makes releasing Bortles in 2019 an expensive option. Cap room was not the only reason for the extension however. Jacksonville believed Bortles made significant progress in 2017 and was a piece of Jacksonville’s future. So how did Jaguars management get fooled into believing in Bortles long-term? The answer is Bortles performed well near the end of the year in 2017. He was averaging a very Bortles-like 58% completion percentage and 6.4 yards per attempt to go with 12 touchdowns and 8 interceptions through 11 weeks last season. He followed that up the next four weeks averaging a robust 9.1 yards per attempt with a 69% completion percentage to go with 9 touchdowns. Bortles also finished the season with an impressive outing versus New England in the AFC championship game. How did he accomplish this upgrade in play? The Jaguars faced incredibly soft passing defenses during those games with Football Outsiders’ 21st, 25th, 28th, and 32nd ranked pass efficiency defenses to go along with a Seattle defense decimated by injuries at the end of season. The Jaguars saw progress where in reality Bortles simply faced lower-end pass defenses and took advantage of the matchups. They ignored the long body of work and let a handful of games dictate their outlook. Jacksonville is now stuck in an ugly situation with no long-term answer at quarterback and the short-term solution is unenviable at best on a team which just missed the Super Bowl last season. Lesson for RSO GMs: Do not let recency bias distort your view of players too much. Relying on players based on a handful of recent games while ignoring everything before can lead to disaster for your fantasy team. Rest of Season Fantasy Outlook: Bortles was a lower-end streaming option before the benching. He is almost impossible to trust now, even as a streamer, given that he may be benched in any game. Look at Bortles as an emergency starter in 2QB and superflex leagues. Bortles was not the only quarterback benched recently. Winston got the hook after a disastrous four interception game versus Cincinnati last week. The Bucs have already named Ryan Fitzpatrick, who was benched for Winston earlier, the starter next week. No one really knows after that. Winston might relieve Fitzpatrick next week if he struggles or at some future week if Tampa Bay is eliminated from contention. Tampa Bay put the fifth year option on Winston which is guaranteed for injury only. This means he also might never see the field again in Tampa Bay if they have determined he is not part of their future in order to eliminate injury risk. Rest of Season Fantasy Outlook: Chaotic. Impossible to predict. What we do know is tremendous weekly upside exists for whoever throws the ball. Tampa Bay averages 376 passing yards per game (58 more than the next highest team) with a stable of high-end receiving threats and a defense among the league’s worst. The upcoming schedule is also great for Tampa Bay passers. Definitely grab Fitzpatrick if he is on your waiver wire. The upside is so high that I would not mind having both him and Winston on my roster. The main problem lies in the fact that either may be benched on any given week possibly ruining you fantasy week. Career finishes rarely end well for NFL star players. Their skills diminish quickly toward the end and they almost never are able to make an accurate assessment of their lower abilities. Manning is no different. Manning is a statue in the pocket with non-existent movement skills who freezes up anytime pressure presents itself playing on a team which really struggles protecting the passer. In this case, the organization failed miserably in evaluating Manning and a New York roster which won three games last season. Management vastly over-estimated this roster and the ability to play competitive football weekly. No realistic backup plan exists for Manning and the quarterback spot. Rest of Season Fantasy Outlook: Manning is a lower-end starting option in two QB leagues. The Giants season is virtually over already which means they may want to get a look at younger quarterbacks on the roster. Be prepared with other options if you are counting on Manning in your league. My annual look at early RSO auction values begins at the quarterback position in 2018. The series was designed to give the reader help in planning for upcoming auctions by looking at actual RSO auctions already finished. The data comes from a variety of different types of leagues with varying scoring rules and starting requirements which can drastically alter player values so be cautious in expecting values to match your particular league. The information does provide a useful starting point for examining how RSO owners value players at a certain position relative to one another and the length of contract they are willing to invest. Aaron Rodgers once again comes in as the most expensive quarterback. The Packers lack any real speed threat at wide receiver which could hurt his efficiency somewhat but he is the best pure passer in the business. Wilson seems an easy choice between him and Watson or Wentz at their similar contracts. I detailed the potential pitfalls for Watson and Wentz coming after their super seasons in 2017. No one should be paying for Luck at his QB7 price point given his substantial injury risk. Newton and Brady provide similar upside at comparable cost without the risk. The top-10 finishes with an interesting group of quarterbacks. Cousins finished as a QB1 each of the last three seasons and now moves to a Minnesota team this year with arguably better receiving weapons. The Vikings feature a far superior defense and better running game which might limit Cousins passing volume. We only have seven starts over the last two seasons to evaluate Garoppolo from but that sample is truly extraordinary. He completed 68% of his passes, averaged over 280 passing yards per game, and owns a monstrous 8.7 yards per attempt over that span on his way to a 7-0 record without a single poor start. His quick release and consistent down-to-down play are easily evident on tape and only confirm the statistics. Brees produced his worst fantasy season in recent memory thanks largely to a massive drop-off in passing attempts. While we likely are through with the upper-600 yearly pass attempts which were previously routine, look for a bump in yardage and touchdowns this season. This tier of players gives us both some nice reliable options and younger quarterbacks with upside but lots of question marks. The tier is bookended by two second year pros. Mahomes possesses an arsenal of quality receiving weapons in KC and a cannon for an arm with good athleticism. Will Reid be able to reign in his poor decision making and inconsistent accuracy? Trubisky enters his sophomore year with a year of experience under his belt and new head coach Matt Nagy from the Reid coaching line. Chicago undoubtedly upgraded the receiving options but one-year wonder Allen Robinson, Taylor Gabriel, Trey Burton, and rookie Anthony Miller are largely unproven. Stafford represents a safe floor with no less than 4,200 passing yards in each of the last seven seasons. Prescott looked like a rising young star his first year and a half with a super offensive line and run game. He looked like a backup-level quarterback the second half of last season who completely fell apart when the offensive line took an injury-hit and Elliott missed time. Goff went from one of the worst rookie seasons ever to one of the most efficient quarterbacks in the league under Sean McVay. Mariota and Winston enter the the final year of their rookie deals showing flashes of starting-level talent but neither living up to their lofty draft status so far. Winston starts the year with a three-game suspension and will try to reign in his mistake-prone tendencies. Mariota gets a new head coach but questions remain whether he is simply a quality game-manager. 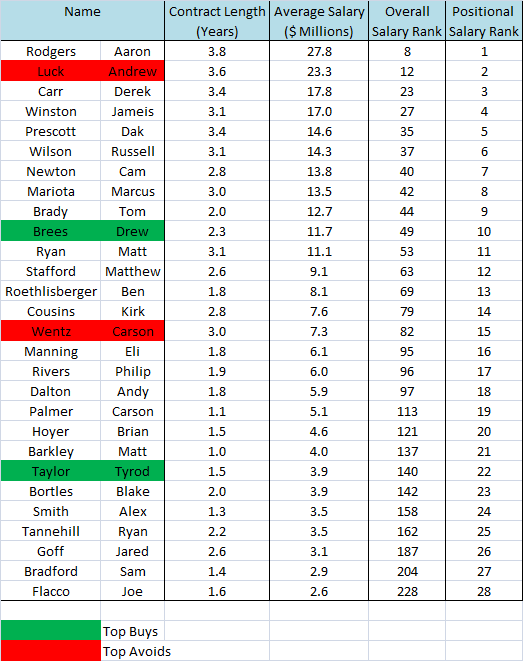 Roethlisberger and Ryan give us good value at the 16th and 17th spot. The Steeler quarterback has received a physical beating over the years but is still a quality fantasy and real-life producer at the position when on the field. 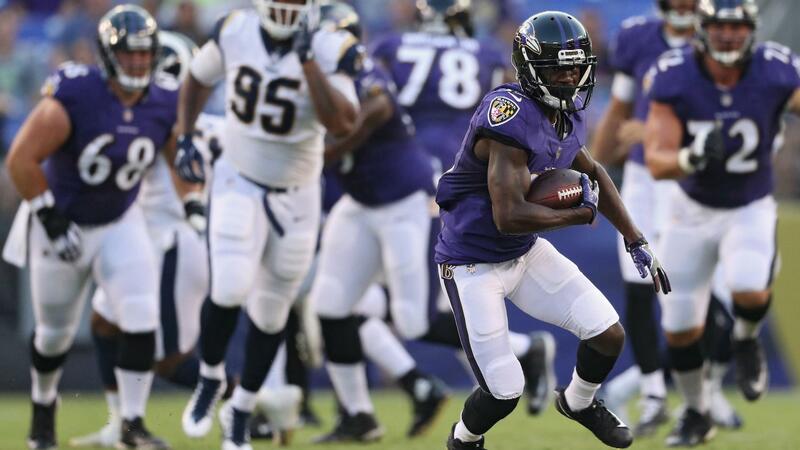 Ryan is a good bounce-back candidate who should see big boosts in yardage and touchdowns. 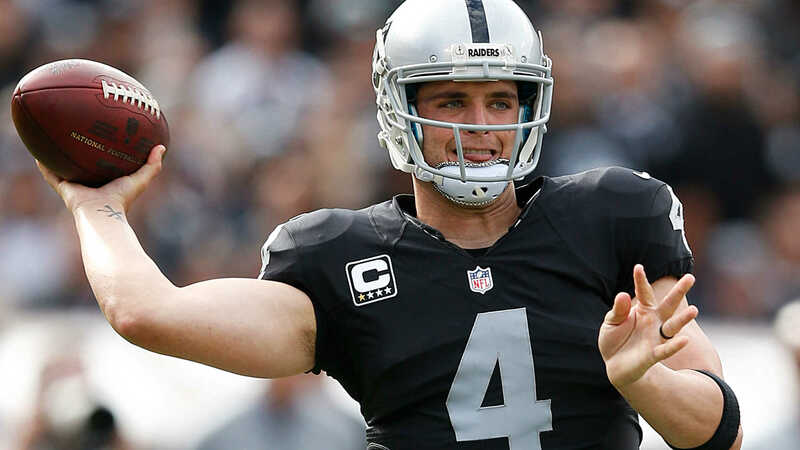 Carr has been one of the least efficient starters in the league over his four years in the NFL. His contract could be cut following 2018 if things go poorly in the first year of the Gruden regime. Our rookie quarterbacks start coming off the board now (Note there was a limited sample of auctions with rookies as most went in rookie drafts). Rosen leads the way soon followed by Mayfield, Jackson, and Darnold while Allen is an afterthought near the bottom of our top-40 list. Jackson is a quality stash on your roster. He has, by far, the most work to do to become an NFL-ready quarterback but is capable of 1,000 yard rushing seasons which translates to massive fantasy upside. Allen probably ends up on a lot of my rosters at his next-to nothing cost. Quarterbacks drafted that high almost always make it through their rookie contracts as starters, even bad ones (see Blake Bortles), and his athleticism with unworldly arm strength give him underrated fantasy possibilities. Smith just posted his best season as a pro at the age of 33 and moves to pass-friendly Washington where Kirk Cousins posted multiple QB1 seasons. The system and lots of receiving talent make a Rich Gannon-type late career finish possible. No quarterback provides more value than Rivers if you are not spending big at the position. He finished 8th or better in passing yards each of the last five seasons with four top-5 finishes and 12th or better in touchdowns with three top-5 finishes. Taylor, Bradford, Flacco, and McCown/Bridgewater are wild cards who all have 1st round rookie picks drafted by their teams behind them. The amount of games played this season by each largely depends on team circumstances where competitive teams probably keep the veteran in. Injury concerns also follow Bradford. Bortles, Manning, Tannehill, and Dalton all surprisingly enter the year with no significant competition, either through the draft or free agency, to replace them. They each should be safe for another season. You will not feel particularly good riding anyone of them each week but some combination of the four could make for an intriguing super-low cost weekly matchup-based unit for your team with all pricing in QB30+ territory. Knowing the types of contracts given out by other fantasy teams can give the alert reader a big advantage when your own RSO free agency auction arrives. Your league settings and available players will have a big impact on the size of contracts given out at various positions, but looking at the relative contracts within position groups provides some useful information. To that end, I begin a new series examining early RSO auctions starting with a look at quarterbacks. Aaron Rodgers comes in as the most expensive quarterback by more than four million per season for a good reason. He finished as the QB1 or QB2 every health season except for one (he finished as the QB7) while he was a starter. There is not a safer player in all of fantasy football in my view. Historically, Rodgers has not been among the league passing attempts leaders, which sometimes limits his yardage totals. He more than makes up for lack of volume with massive yearly touchdown totals do to extreme efficiency and extensive red-zone usage. The Packer star also adds nearly mistake-free play, not throwing double-digit interceptions for seven seasons. With all of the gushing praise just put on Rodgers, I will not own him in many leagues. The drop-off from Rodgers to more cost-friendly options is not enough for me to justify the enormous premium placed on Rodgers in most instances. Andrew Luck is the next quarterback at $5.5 million more per season than the third QB. Luck finished as the QB2 and QB5 in PPG for 2014 and 2016. The talent and upside are undeniable but his current price does not reflect the risk involved of a quarterback with multiple shoulder injuries who is not throwing the ball yet. There are others available for a much cheaper cost (Russell Wilson for example) with similar upside and without the injury concerns. The youth movement appears to be in full effect for quarterbacks in RSO leagues. Derek Carr, Jameis Winston, and Dak Prescott come off the board next. Carr and Winston, in particular, represent purely speculative projections at this point. Carr paved the way to his best fantasy finish as the QB10 in PPG while Winston has not finished better than the QB19. Tampa Bay added premier deep-threat DeSean Jackson and the first tight end taken in the NFL draft, O.J. Howard this offseason where Oakland took a more modest approach on the receiving spectrum adding tight end Jared Cook and return specialist Cordarrelle Patterson. None of these additions warrant the cost of these players. 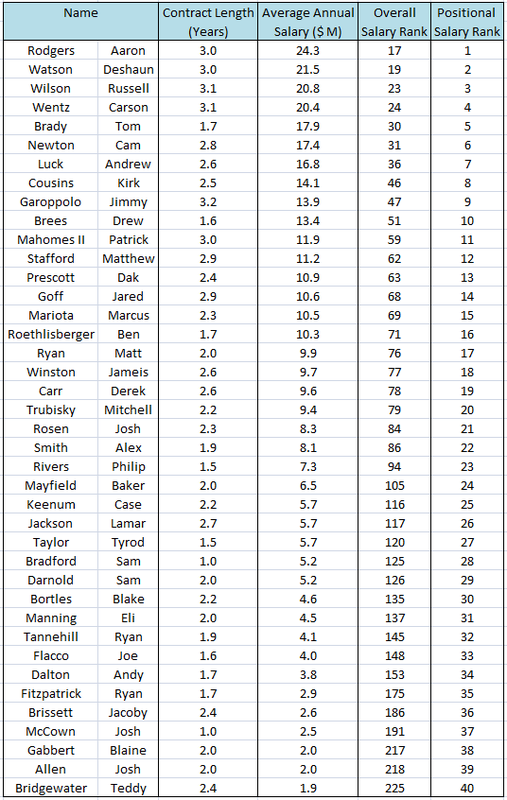 Moving down our table we find Tom Brady, Drew Brees, and Matt Ryan as the QB9 through QB11. This seems like a bargain for the QB2, QB3, and QB5 from last season even taking into account the expected regression from the group in 2017. Ryan obliterated his previous career highs in essentially every statistical passing category and the Falcons lost their offensive coordinator Kyle Shanahan who moved on to coach San Francisco. Less discussed is Brady’s likely regression coming into his age 40 season. The Patriots’ quarterback put up his best season since his 50-touchdown performance in 2007 with a campaign that included a crazy 28-2 touchdown to interception ratio. Brees, on the other hand, had a very normal Brees-type season. He is among the most consistent quarterbacks in the league. One must look all the way back to his time in San Diego for a finish outside the top 6. Expect another one in 2017 with around 5,000 passing yards. There are many less expensive, quality alternatives to be found for those looking to go cheap at quarterback in either 1-QB 2-QB/Superflex leagues. Phillip Rivers is a rock solid borderline QB1/QB2 who consistently provides value at his mid-QB2 cost. Andy Dalton provides a lot of upside at the QB18 position. He finished as the QB3 in 2013 and was the QB4 through week 13 in 2015 prior to an injury which ended his season. The Bengals signal-caller carries more volatility than most with a revamped offensive line that struggled in 2016 and arguably lost its two best linemen in free agency. This is balanced by a loaded skill position group which gets two of Cincinnati’s most dynamic playmakers back from injury, tight end Tyler Eifert and wide receiver A.J. Green. The Bengals also added two of the top offensive talents in the draft, wide receiver John Ross and running back Joe Mixon. For my money, Tyrod Taylor represents the best value among quarterbacks in 2017. He finished as as a QB1 in PPG the last two season thanks in large part to his dynamic rushing ability. His limitations as a pocket passer likely prevent him from being a top end performer, but the ability to get a solid starter at backup money is what makes an RSO team. Rivers, Dalton, and Taylor all cost less than Philadelphia Eagles Carson Wentz for some reason. Wentz predictably struggled mightily as a rookie finishing outside the top-24 quarterbacks in passer rating and QBR. He was let down by one of the worst receiving groups in the NFL and a coaching staff that asked far too much of a rookie forcing Wentz to throw the fifth most attempts in the league. Wentz has the physical tools to become a good quarterback, but there is not much reason for an RSO team to gamble with a significant, long-term investment on an unknown when there are plenty of cheap, reliable alternatives. This offseason could be one of the more intriguing in memory thanks to an unprecedented amount of quarterbacks possibly switching teams. Stable starting quarterbacks rarely move because finding just competent level players at the position is incredibly hard in the NFL. This year’s candidates for taking over starting jobs in other locations include, among others, free agents Kirk Cousins, Brian Hoyer, and Mike Glennon; trade/release options Tony Romo, Jay Cutler, Tyrod Taylor, Jimmy Garappolo, Colin Kaepernick, Nick Foles, and A.J. McCarron; plus rookies DeShaun Watson, Mitch Trubisky, and DeShone Kizer. This article examines possible landing spots based on a variety of factors including team composition, draft capital, and salary cap situation. The large supply of veteran quarterbacks available with starting experience could make for a very interesting market this offseason at the QB position and will undoubtedly force many into backup jobs. The Texans provide the premier landing spot for our quarterback class. The defense was among the better units in the NFL in 2016 without superstar defensive lineman J.J. Watt. The offense boasts quality playmakers at wide receiver (DeAndre Hopkins) and running back (Lamar Miller) plus a decent offensive line which should improve next season. Houston is set up to win now except for the quarterback position in one of the NFL’s weakest divisions. There is no need to write more about the struggles of Brock Osweiler. Tom Savage looked the part of starting QB for about a half of football then reverted to a player who did not belong on the field. Best fits: Tony Romo, Jimmy Garoppolo. Houston should find a way to get Romo on the roster despite the difficulties with Osweiler’s contract and Houston’s cap issues. He instantly makes the Texans a legitimate Super Bowl contender and Houston does not want to waste the limited time frame of a great defense. Garoppolo answers the cap issue and Houston’s 25th pick would be hard to resist by New England as part of a trade but the Osweiler debacle makes investing in another QB with limited experience scary for Houston. Selecting a QB at 25 in the draft is another cap-friendly option addressing the position. Both of these teams seem caught in that blurry area of having just enough roster strength to possibly fight for a playoff spot but having far too many weaknesses to truly contend. Both were major disappointments in 2016 failing to make the playoffs. The Bills (10) and Jets (6) are both at spots in the NFL draft where one of their top rated quarterbacks may fall to them. Buffalo brings in a new coaching staff led by new HC Sean McDermott. The Bills are unlikely to pick up the large option on current QB Tyrod Taylor. The defense unexpectedly bottomed out in 2015 and 2016 under former coach Rex Ryan. A few analysts made a questionble argument this team is close to competing with the addition of a solid quarterback based on a strong run game and solid offensive line. A major improvement from a defense among the worst in the league against the run and not good against the pass would have to happen for any talk of contention to occur however. Best fits: Jay Cutler, Mike Glennon. This depends a lot on whether the organization views Cardale Jones as a long-term project or an eventual successor. Buffalo management must find the direction they want to take this team. Signing a cost-friendly free agent quarterback gives this team desired flexibility for the future. Cutler should come relatively cheap, provides a short-term fix with recent upside (QBR 10 in 2015, QBR 3 in 2013), and has the arm needed for Buffalo’s late season weather. Resigning Taylor is another option but looks unlikely given the current contract situation. New York faces a difficult choice about whether to take one last shot or start the rebuild process. The roster is full of aging former stars including running back Matt Forte (who was clearly outplayed by Bilal Powell in 2016), wide receivers Brandon Marshall and Eric Decker (who suffered through injuries and the awful version of Ryan Fitzpatrick), and cornerback Darrelle Revis (whose days as a starting corner look over). This looks like a team in need of a fresh start when adding in an elderly offensive line and a secondary that was among the worst in the league last season. The Jets also have one of the worst salary cap situations in the league with limited flexibility to obtain significant cap room. Best fits: DeShaun Watson, Colin Kaepernick. Time to start over with the top rated QB left on their board. This is too early in the draft for this quarterback class but better to take the gamble on a possible franchise QB. This team is going nowhere soon, the top tier defensive prospects might be gone at 6 in the draft, and the Jets do not have the cap space to make big moves in free agency. The Jets might also effectively “punt” next season on quarterback and sign one of the lower-end options available in free agency like Kaepernick or Nick Foles to compete for the starting job. These teams occupy the top three positions in the NFL draft after winning a combined six games in 2016. Each team has significant holes throughout the roster to be filled. Each organization has plenty of cap room with Cleveland and San Francisco holding the most cap space in the league. The cap space and draft capital give each of these teams a variety of options available in addressing QB needs. Taking one of the top quarterbacks is certainly an option but might not be the wisest choice for a top-three pick with the uncertainty surrounding this rookie class. Best fits (Cleveland): Tyrod Taylor, DeShone Kizer. Taylor allows Cleveland to keep all of their draft picks which the Browns management covets. Hue Jackson displayed a willingness to work with Robert Griffin III who has a similar skill-set to Taylor. Kizer makes for an intriguing pick at the 12 spot but could fall further. The Irish quarterback has all the required physical traits and throws one of the better balls among the rookie class but needs a lot of coaching to become ready for the NFL. Best fits (San Francisco): Mitch Trubisky, Jay Cutler. San Francisco feels like another team who could wait in determining a long-term quarterback solution. The roster is nowhere close to competing despite new GM John Lynch’s optimism. New head coach Kyle Shanahan will not force the issue for quarterback at the top of the draft if he is not confident about the talent available and has ties to Cutler. Many consider Trubisky the most accurate QB in the draft, if San Francisco goes in that direction, but questions surround the Tar Heel with a limited sample of game film to go off of. Best fits (Chicago): A.J. McCarron, Patrick Mahomes. Chicago is a team who could compete sooner than many would presume. There is a strong rushing attack anchored by a very good offensive line and injuries decimated a defense which could be better than expected in 2017 if the Bears find some help in the secondary. McCarron makes for a low-risk option which should come much cheaper than Garappolo. Any team acquiring McCarron will also have an extra year of control with his contract as a restricted free agent in 2018. The Bears should re-sign Brian Hoyer, who showed well in limited action this season, whether as the backup or a bridge to the future for a quarterback taken later in the draft like Texas Tech standout Mahomes. There has been talk of Romo going to Denver but the Broncos seem happy enough with their quarterback situation and just used a first round pick on Paxton Lynch last year. Kirk Cousins is staying in Washington on the assumption somebody in the Redskins management maintains some level of reason. Cousins will probably get the franchise tag again as there is no backup plan to Cousins leaving. Kansas City is another popular landing spot for Tony Romo to put the Chiefs over the top. This seems somewhat unlikely on a team with 23 wins over the last two seasons, a competent quarterback, and limited salary cap flexibility. My first love was college football. Like every long-term relationship, college football and I have had our ebbs and flows throughout the years. Recently we’ve been in a lull due to the fact that I have Rutgers season tickets and I typically spend 6-8 hours at the stadium on a game day. Factor in an annual away game (Ann Arbor here I come again this year) and I’m missing about 8 weeks of college football action each season. Thankfully, playing on RSO has helped me refocus and concentrate on the incoming rookies and starting with today’s piece my writing on RSO will be devoted to rookies and the college game. Check back throughout the offseason for more rookie-centric research, film study and mock drafts. First up, let’s take a look at the top of the 2017 rookie QB class. By many accounts, Mitch Trubisky will be the first quarterback selected in the 2017 NFL Draft and much ink will be spilled discussing him. Trubisky is a Junior who is coming out after just one full season as a starter. The only game in which he had significant reps as a Sophomore came against FCS Delaware when he filled in for injured starter Marquise Williams. In 2016 he totaled 3,748 passing yards, 30 TDs and 6 INTs. He also added decent production on the ground with eight games of either 30+ yards or a rushing TD. Trubisky’s best outing was against #12 FSU where he completed 31 of 38 passes for 453 yards and 3 TDs; he also added a rushing TD. His worst outing undoubtedly came against #25 Virginia Tech when he went 13-33 for just 58 yards, zero TDs and 2 INTs. I watched Trubisky’s film against Duke and Stanford. One of the first things I noticed about him is that his feet never stop moving in the pocket. He is always poised to throw but is equally able to evade the rush and escape the pocket. Twice in the 3rd quarter against Duke, Trubisky fled the rush and turned a sack into positive yardage (one of them into a first down actually). He did the same a number of times against Stanford and their Top 5 prospect DE Solomon Thomas. Unfortunately a last second two point conversion attempt to tie the game was one example of the pressure getting home and Trubisky being unable to escape. Against Stanford he also threw two bad INTs which ended possessions the Tar Heels desperately needed late in the game. The second half of the game against Stanford perfectly encapsulates Trubisky’s draft prospects. In the 3rd quarter, on 2nd & 11, Trubisky eludes the pressure and throws a flat-footed pass 40 yards for a first down. In the 4th quarter, 3rd & Goal, down 8 points with 30 seconds left, Trubisky rolls right toward the boundary but is pressured. He circles back towards the field, quickly sets his feet and throws a dart from the opposite hash for a touchdown (he threw a similar TD pass from the opposite hash in the 1st quarter of the Duke game). The next play was the aforementioned two point conversion sack that essentially ended the game. He certainly has the arm strength and athleticism to make it in the NFL but he’s just a step short. Will he be the first quarterback drafted? I think so and somebody will likely take him in the Top 10 but that is too rich for me. Kizer will be over-drafted because of his size, plain and simple. He is 6’4″ and 230lb which should peg him as the biggest quarterback prospect other than Davis Webb who will be drafted significantly later. He certainly won’t be drafted for the stats he put up at Notre Dame. He had a horrendous completion percentage of 58.7% in 2016 and did not break 3,000 passing yards in either 2015 or 2016. He does have some “boom” capability though so be careful which tape you watch – he went off for 5 TDs and 0 INTs twice, once in 2016 against Texas and once in 2015 against Pitt. What makes his size so tantalizing is the speed that goes with it – he’s tough to bring down in traffic and if he gets into the open field, he’s gone. When I watched Kizer’s film, I was struck by how uncomfortable he looked under pressure which I thought might be a strength given his athleticism and speed. Kizer often seems to forget about the rush once it gets behind him and gets sacked from behind rather than stepping up and out of the pocket. Against Stanford, I counted four sacks like this; two of which came on the last drive when the Irish were down 7 points. I was not impressed with his accuracy or arm strength when rolling out. I also question his attention to detail: between the two games I watched, Duke being the other, Kizer dropped two snaps and botched a handoff. Lastly, his awareness of game situation and field position worries me. Of all of the film I have watched so far of the rookie QBs, Kizer has by far the worst throw. Let me set the stage… it’s 35-35 against Duke with just 5 minutes left, Notre Dame has the ball in the shadow of their own goal posts and it’s 3rd & 20. Kizer drops back to pass, into his own endzone, shuffles left and throws a duck without setting his feet. The pass is easily intercepted at the Notre Dame 45 yard line. The announcer basically says, “no big deal, they would have punted anyway” but that is asinine. If Kizer was able to gain even 5 yards to give his punter some room, they could have ensured that Duke at least got the ball back in their own half instead of plus territory. Duke took over, killed 4+ minutes and kicked a 19 yard field goal that ended up being the game winner. Some quarterback desperate team will inevitably take Kizer in the Top 15 due to his physical tools but I wouldn’t want my team making that mistake – he will need time to develop and he won’t get that if he’s taken in the top half of the first round. DeShaun Watson will be the name that most casual fans will be familiar with and the one that I am most worried about RSO owners reaching for. Watson has played in two National Championship games, one of which he won, has finished in the Top 3 of Heisman voting twice and has more than 10,000 career passing yards. Watson certainly has a championship pedigree but can he turn that into success in the NFL? Not unless he can stop throwing interceptions. Without even watching any film of Watson, you can quickly determine his biggest negative… he throws way too many INTs. In 2016 he threw 17 and in 2015 he threw 13. Does this sound familiar? Okay you’re right I ragged on Watson for his interceptions in the lead up to January’s championship game, so I’ll move on. When I started watching film of Watson, I had a preconceived notion that his interception problems were caused by his limited reading of the field. After watching 2016 outings against Auburn and Ohio State, I still believe that. Against Auburn, the first game of the season, you will find very few throws when Watson looks away from his primary receiver. Against Ohio State, in the semi-finals, he was improved but still not what you would hope for from a franchise quarterback. Going back to the Auburn game, I also noticed three times when Watson’s throw was deflected at the line of scrimmage. Depending where you look he is either listed at 6’3″ or 6’2″ – I would not be surprised if his height becomes a problem come combine. Watson is obviously supremely talented and I think that his field vision issues could be helped by the right coach (whether that means giving him half-field reads or actually helping him improve) so I’d be willing to give him a shot in the late 1st round. If there is one quarterback in the first round that I would be targeting it would be Mahomes. Many draft resources have him listed as the 4th prospect behind Trubisky, Kizer and Watson but I believe he should be right up there with Trubisky. Given the difference in draft pick needed to nab the two, Mahomes would be my pick. It’s easy not to give any credence to the numbers that Mahomes (and past air raid quarterbacks) put up but let’s just take a quick look because they are insane. He threw for over 11,000 total passing yards in his career and 93 TDs. In 2016 he had six games of 400+ yards, three games of 500+ and one of 700+. Add in 22 career rushing TDs and you have an all-around prolific quarterback. All of Mahomes’ stats (yards, touchdowns, yards per attempt, interceptions, etc) improved year over year from 2014 to 2016. Watching film of Mahomes is a bit misleading due to how many attempts he has each game, but it was sill instructive – anybody could find pros and cons when you have 50+ attempts. You will notice immediately that his footwork needs improvement – he throws off one foot often – but he has the arm strength to overcome. To my eye, he looked most comfortable when rolling out of the pocket and only had half of the field to read. When on the run, he throws accurately. Like Kizer, he seems to struggle with stepping up and out of the pocket, oftentimes he just stepped right into a sack. Two things that I loved when watching Mahomes play against Arizona State… First, he drew two offsides and turned one of those into a touchdown on a free play. That is something you see in the NFL (Aaron Rodgers anybody? Just kidding) and not so often in college. Second, he executed this one play perfectly a few times, once going for a touchdown, where he has a long fake at the mesh point and then fires a quick bullet to a slanting TE. He was knocked out of the game against Kansas but it was not a serious injury. Mahomes, like the other three profiled here, is not perfect but I think his trajectory is pointing in the right direction and he is worth a pick by a fringe playoff team around 20th overall.